Climate nationwide campaign "Change the system, not the climate!" On the eve of the UN Climate Conference Ukrainian together with other active citizens of the world take to the streets of their cities to call on Ukraine to implement government measures to combat climate change. Namely, insulate homes, develop public transport and cycling infrastructure to switch to renewable energy sources, energy sector reform, to implement separate collection and recycling of waste, require the company to bring emissions of pollutants to the European norms and so on. We invite everyone who shares with us the idea of ​​clean and safe future without climate change. Anyone who is willing to urge the government to move to 100% clean and renewable energy. We expect that you will come without political symbols, logos or corporate campaigns to defend the idea of ​​climate protection and secure the future of Ukraine and the world. 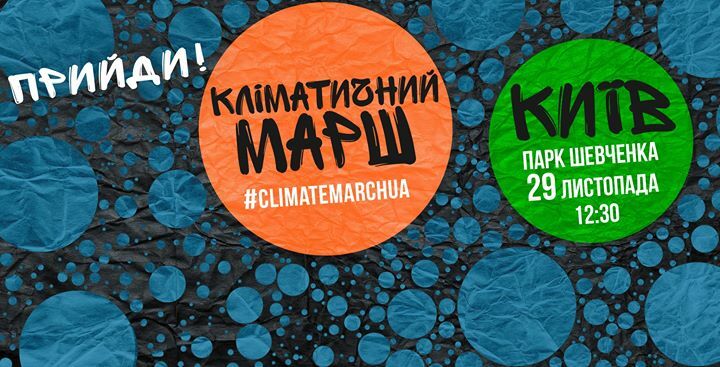 Here we report all climatic shares / flash mob, which will be held in Ukraine 29.11.